Social Democratic Party (SDP) candidate Senator Iyiola Omisore has joined forces with APC to fight the PDP in the upcoming rerun in Osun state. 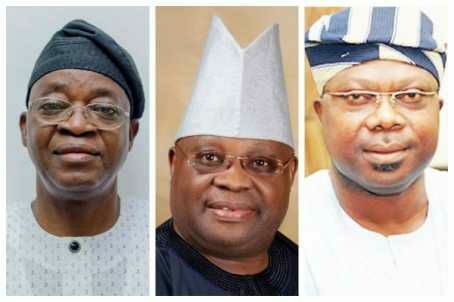 The rerun election will determine the winner between Isiaka Oyetola of the APC and PDP candidate Ademola Adeleke. Saturday’s election was declared inconclusive by the Independent National Electoral Commission (INEC) which ordered the supplementary election in seven polling units in four local governments – Osogbo, Orolu, Ife North and Ife South. There are 3, 498 registered voters in the polling units where the elections were cancelled due to various reasons, including hijacking of election materials, abscondment of presiding officer, disruption of election by hoodlums who were shooting sporadically, manual accreditation and over voting. The supplementary election is a straight fight between Oyetola and Adeleke. Adeleke has a marginal 353 votes advantage in the election in which Omisore finished third. Omisore hosted an APC delegation of Ekiti State Governor-elect Dr Kayode Fayemi and Dr Olu Agunloye at his home in Ile-Ife. On Monday, he received Senate President Bokola Saraki, who came to lobby him to support the PDP.